When you're considering your options for a minivan to transport your family or friends, Glassford Chrysler is ready to show you the variety of features offered by the Chrysler Pacifica. There's an option for every type of driver and budget. Regardless of your driving habits in Ingersoll, the Chrysler Pacifica will keep you and your passengers safe and comfortable. To maximize the impact protection that it offers, it is made of lightweight, high-strength steel. The frame is both strong and stylish. If you're looking to make your Chrysler Pacifica stand out, you can upgrade the 17-inch wheels to a 20-inch set. 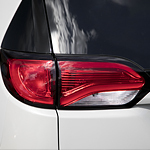 For high visibility at night, the Chrysler Pacifica comes equipped with HID headlamps that will give you maximum time to react to something in the road ahead of you. The LED signature daytime running lamps increase your visibility in variable lighting conditions.